INISHOWEN wildlife enthusiasts were delighted to get the lowdown on a graceful lady swanning around Inch island over Christmas. 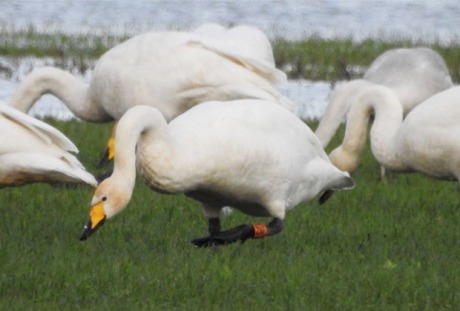 Several members of Wild Inishowen were pleased when they managed to photograph the identifying details of a whooper swan with a ring on its left leg. A female whooper swan photographed by Wild Inishowen club members at Inch Wildfowl Reserve over Christmas. She had been ringed in Iceland in the summer of 2014. They duly sent the information off to their friends in the Wildfowl and Wetlands Trust in England in the hope of getting more details on the bird. "A very speedy email reply from Kane Brides...included the information on the whooper swan. It's a female bird which was caught and ringed on the 6/8/2014 at SandVatn, Myvatnsheidi, Iceland. Our sighting report will now be added to the database at WWT Slimbridge. "It is always a privilege and pleasure to be involved in their vital recording migration journey," the Inishowen club told Facebook followers. Ireland hosts more than a fifth of the European wintering population of whooper swans, according to BirdWatch Ireland. They over-winter at ten or less sites in Ireland with Lough Swilly and Lough Foyle being important habitats.